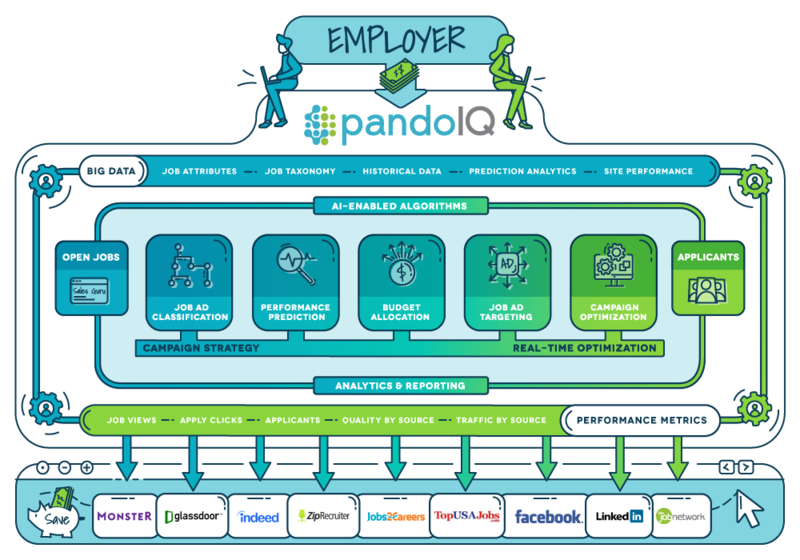 Our programmatic job advertising platform, pandoIQ, intelligently automates and optimizes job advertising spend. Companies faced with complex hiring needs now can source quality applicants faster, smarter, and more efficiently with our unique proprietary technology. The platform features AI-enabled algorithms that use over 48 job attributes and more than 200 billion historical job performance data points to predict the optimal job advertising campaign. Target relevant candidates across all the major search recruitment sites including Indeed, CraigsList, LinkedIn, Monster, CareerBuilder, ZipRecruiter and hundreds of others and spend accordingly. pandoIQ provides an end-to end job advertising solution that delivers a significant increase in job ad performance without any wasteful spending. Proprietary algorithms fully-automate and optimize decision making during every stage of the job advertising process from job classification and targeted distribution to budget allocation and dynamic CPC bidding across an employer’s diverse job categories. Predictive benchmarks are leveraged to dynamically allocate budget across all job types and spending caps are applied on specific jobs to eliminate waste and ensure budget constraints are met. Key job variables are automatically analyzed using a job taxonomy and Natural Language Processing (NLP) to derive a predictive-performance benchmark used to create the ideal campaign and strategy to target the right job seekers, on the right sites, at the right price. An online analytics dashboard enables employers to make proactive decisions to improve recruitment processes with real-time access to predictive and actual performance data across all jobs.